What with three children under the age of five, reading has become something of a luxury during this season of my life. I just counted a stack of four books waiting to be read on my night table, and I am consistently at least one month behind on both our New Yorker subscription and our weekly local paper. This may place me squarely within the norm, but it’s unusual for me. However, there is some very regular reading happening in my life right now: all day long I am immersed in children’s books, which is how I recently happened to be re-reading Charlotte’s Web with my oldest daughter. E. B. White’s 1952 book, Charlotte’s Web, is, as we all know, a classic. Its appeal seems to be timeless. Children love it, adults love it. It may not be a children’s book so much as a universal book. It’s been discussed and dissected and written about to death. Probably what I’m about to say is completely unoriginal; I’m sure somebody’s written the same thing in a 1989 freshman English paper. But I didn’t do any research to verify my originality, because this is something I want to say. (Kind of hard these days to feel like you have an original voice about anything, between all the brilliant minds of the past centuries PLUS the current information overload of the internet.) So, here you go; this made a big impact on me, even if it’s old news to everyone else. I love Charlotte’s Web as much as the next person, but I usually think of it in fairly simple terms: a heartwarming tale about friendship and love, with a bittersweet introduction to mortality at the end. But while re-reading it, the exchange between Mr. and Mrs. Zuckerman, Wilbur’s owners (which I’ve quoted above), grabbed me in a way that it hasn’t before. Here’s Mr. Zuckerman, understandably gobsmacked at just having seen the words “Some Pig” woven into a spiderweb above his pigpen. He jumps to the most obvious conclusion: “We have no ordinary pig.” It’s Mrs. Zuckerman (the wife, of course — but no more on that!) who quite correctly notes that the really extraordinary animal is the spider who’s woven the words into her web. It’s a clever little exchange, but the more I thought about it (and I was folding laundry at the time, so I may have been overthinking just a tad), I realized that this is the only time in the entire book that Charlotte gets the recognition she deserves. Shortly after this scene, people begin coming from far and wide to see “ZUCKERMAN’S FAMOUS PIG,” and Wilbur goes on to win the blue ribbon at the county fair. 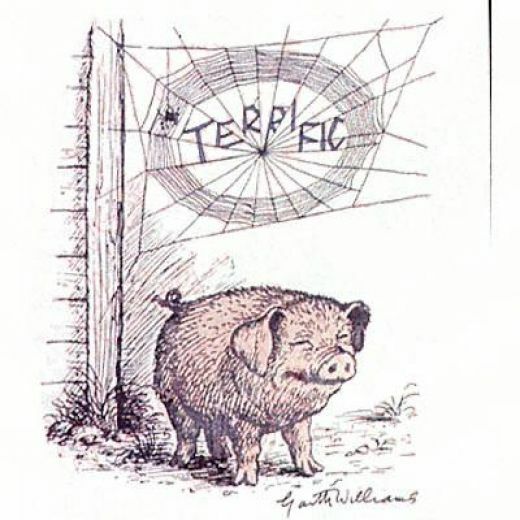 Apart from Mrs. Zuckerman’s astute observation, not one person — not even Fern, the enlightened little girl who’s Wilbur’s first champion — directs attention away from the pig and toward the spider who continues to weave words of praise into her web. Charlotte has the affection and admiration of all the other barn animals, but nobody ever suggests that she should be in the limelight instead of Wilbur. This is pretty remarkable, because the truth is: Wilbur really is just an ordinary pig! Charlotte knew that all she had to do was change the way that others looked at Wilbur: a few suggestive words in her web (“Some Pig,” “Terrific,” and “Radiant!”) completely transformed how people viewed this ordinary pig. And reality followed; once Zuckerman was convinced that Wilbur was special, he started treating him better and Wilbur became a prize-winning pig. In short, Wilbur became extraordinary simply because Charlotte said he was. There are a couple of ways to interpret the message of Charlotte’s Web. One is of the cynical, “The Emperor Has No Clothes” variety: you can fool people through good advertising. Perhaps Charlotte’s Web is really about the value of hiring a good publicist. But I don’t do cynical very well these days, so here’s what I think: I think that E. B. White was getting at something deeply true. I think that if more of us acted like spiders, we could change the world. Let’s move from the barn to the human realm: I’m certain that Charlotte’s trick works with people, too. In fact, if we apply it to children we call it “good parenting.” When we love our children and weave webs of affirmation for them, we change their lives. I don’t mean that we should tell our children that they’re the most beautiful, intelligent, and talented people in the world — that’s just setting them up for disillusionment. But when we recognize and praise their strengths, their best qualities, their unique gifts, we change the way our children see themselves, which will change how they behave out in the world, which might just change how others see them. Of course, this doesn’t apply only to children. Many of us — perhaps most of us — feel like we’re headed for the bacon shelf. So what would happen if more of us wove invisible webs of praise and affirmation for the people we interact with every day? And here’s the real challenge: what if we wove these webs without expecting any gratitude or recognition in return? Because that’s what Charlotte had to do in order to save Wilbur’s life; if people had looked past the pig to admire the spider, Wilbur would’ve been shrink-wrapped at the end of the book. I know the answers to those questions; I’ve had my own personal and spiritual Charlottes, and they’ve changed my life. After all, isn’t Jesus basically the ultimate Charlotte, weaving the word “GRACE” above each of us? I’d like to try to be more of a spider. Maybe we should start an underground movement of web-weavers and change the world, one good word at a time. Just a few laundry-folding thoughts . . .
3 Responses to Some Spider! You, Faith Gong, are a Charlotte in my life! I can always rely on your words to inspire me. Sign me up for your Underground Web Weavers Club. May the Lord continue to bless others through your writing. Some Spider indeed!! Oh, Elain, thank you for being such a spider! 🙂 What a nice comment. Although I don’t really deserve this: it is much MUCH easier to write about things than to actually do them!